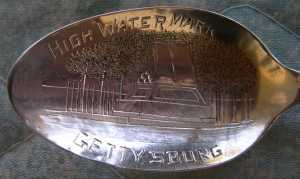 Engraved "Gettysburg High Water mark"
This designation was introduced after the war when the monuments of the Gettysburg Battlefield were being erected. Historian John B. Bachelder used the phrase in a large bronze scroll placed at the "copse of trees" near the Angle, a right-angle turn in a low stone wall. Some historians have argued that the battle was the turning point of the war and that this was the place that represented the Confederacy's last major offensive operation in the Eastern Theater. The Angle.On the third day of the battle (July 3, 1863), Confederate General Robert E. Lee ordered an attack on the Union center, located on Cemetery Ridge. This offensive maneuver called for almost 12,500 men to march over 1,000 yards of dangerously open terrain. Preceded by a massive but mostly ineffective Confederate artillery barrage, the march across open fields towards the Union lines became known as Pickett's Charge; Maj. Gen. George E. Pickett was one of three division commanders under the command of Lt. Gen. James Longstreet, but his name has been popularly associated with the assault. Union guns and infantry on Cemetery Ridge opened fire on the advancing men, decimating the Confederate ranks. Pickett's men were able to breach the Union lines in just one place, a bend in the wall that has become known as "the Angle." This gap in the Union line was quickly closed with any Confederate soldiers who had breached it being quickly captured or killed. Lee's Army of Northern Virginia retreated the next day, leaving Gettysburg for Virginia. Even though the war lasted almost another two years, Lee launched few offensive operations during that time, none of them near the scale of the Gettysburg Campaign. Vicksburg National Cemetery embraces 116 acres, and holds the remains of 17,000 Civil War Union soldiers, a number unmatched by any other national cemetery. Covering ground once manned by the extreme right of Maj. Gen. William T. Sherman's XV Army Corps during the siege of Vicksburg, it was established by an act of Congress in 1866, and serves as the final resting place for United States soldiers who gallantly served this country in times of national and international conflict. During the Civil War, soldiers that succumbed to wounds or disease were typically buried close to where they died. 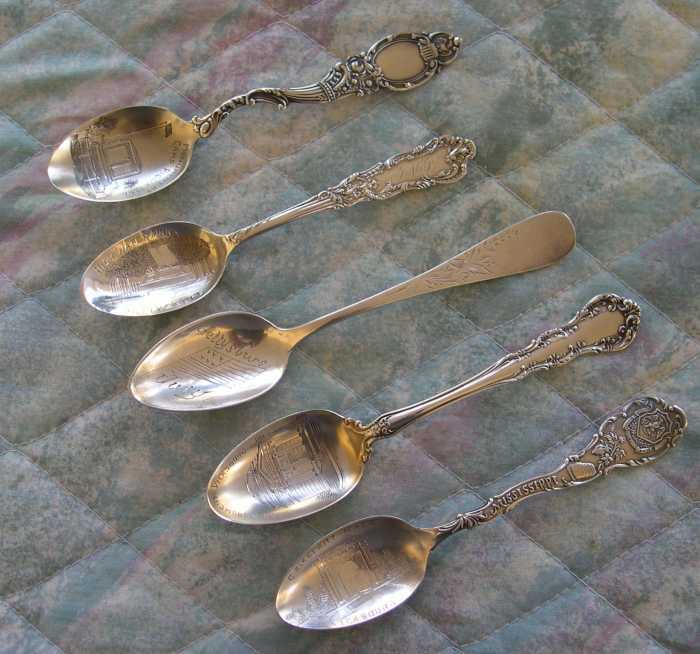 If their name was known, their grave could be marked with whatever materials were at hand — most commonly the etching of the name into a wooden board. After the creation of Vicksburg National Cemetery, extensive efforts were made by the War Department to locate the remains of Union soldiers originally buried throughout the southeast in the areas occupied by Federal forces during the campaign and siege of Vicksburg — namely, Arkansas, Louisiana, and Mississippi. However, by the time of these re-interments many of the wooden markers had been lost to the elements, and identification of many of the soldiers was rendered impossible. 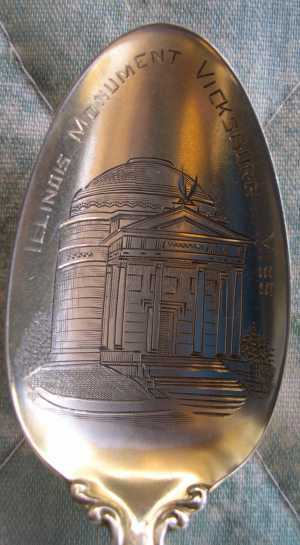 The Illinois State Memorial is located on Union Avenue at milepost 1.8, tour stop #2. Dedicated on October 26, 1906, the monument was transferred to the United States by Governor C.S. Deneen and accepted by J. S. Schofield of the United States War Department. It was erected by the firm of Culver Construction Company with William B. Mundie contracting the designers and sculptors. 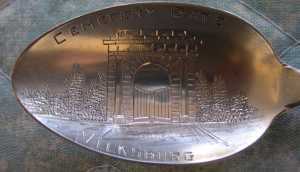 The design was by W. L. B. Jenney and sculptor was Charles J. Mulligan. Stone Mountain (GA) granite forms the base and stairway. Above the base is Georgia white marble. There are forty-seven steps in the long stairway, one for each day of the Siege of Vicksburg. Modeled after the Roman Pantheon, the monument has sixty unique bronze tablets lining its interior walls, naming all 36,325 Illinois soldiers who participated in the Vicksburg Campaign. The monument stands sixty-two feet in height, and originally cost $194,423.92, paid by the state of Illinois. 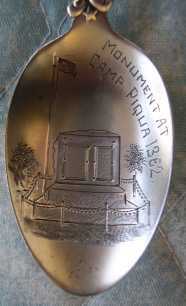 The One Hundred and Tenth Ohio was organized at Camp Piqua, Ohio, on the third of October, 1862. During its term of service the regiment was in twenty-one engagements, and sustained a lost in killed, wounded, and missing, of seven hundred and ninety-five men. It was mustered out at Washington City, on the twenty-fifth of June, 1865, and was discharged at Tod Barracks, Columbus, Ohio. 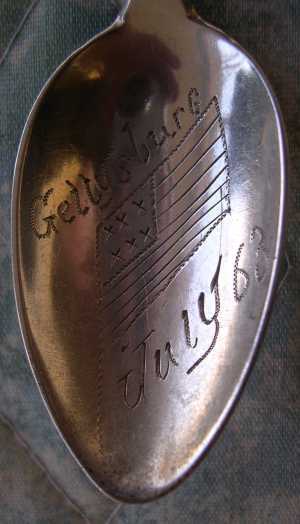 Note: even though this spoon is engraved with the date 1862, it was made in the 1890's to commemorate that event. You will find dealers who will swear on a stack of bibles that it was made in 1862.